Suresh Prabhu is out as India's railway minister. Piyush Goyal is in. Rediff.com's Aslam Hunani analyses the train mishaps that marked Prabhu's tenure as railway minister from 2014 to 2017. On August 19, 2017, 13 coaches of the Kalinga Utkal Express derailed in Khatauli, Uttar Pradesh, killing over 20 passengers and injuring over 150. If there was one change in Narendra Modi's council of ministers that no one doubted, it was the departure of Suresh Prabhu as India's railway minister. Prabhu had been under pressure to resign after back-to-back train derailments and accidents in the second half of August. On August 29, the Nagpur-Mumbai Duronto Express derailed between Vasind and Asangaon stations in Maharashtra. On August 25, six coaches of an Andheri-bound local train derailed in Mumbai, injuring six passengers. On August 23, at least 100 people were injured when the Kaifiyat Express derailed in Auraiya, UP. On the same day, a train collided with a lorry at an unmanned rail crossing in Villupuram, Tamil Nadu. Railway officials in Delhi described it as a 'minor incident'. On August 19, 13 coaches of the Kalinga Utkal Express derailed in Khatauli, UP, killing over 23 people and injuring over 150. Prabhu's tenure was also marked by one of the worst train accidents in recent years. 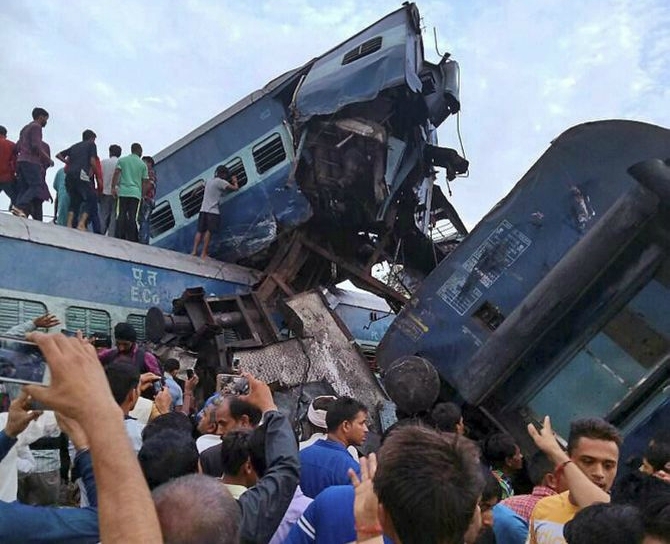 At least 150 passengers were killed and more than 200 injured, half of them grievously, when 14 coaches of the Indore-Patna Express derailed in Pukhrayan in Kanpur rural area on November 20, 2016 due to suspected rail fracture. Safety remained a big concern for the railways under Prabhu's tenure. According to National Crime Records Bureau figures for 2015, a massive percentage of the railway accidents occurred due to mechanical faults. More then 322 people lost their lives and around 900 people were injured in the major train accidents that took place since the time Prabhu took office as railway minister. Prabhu has now moved to the commerce and industry ministry. Piyush Goyal has taken over as railway minister. How long will the Railways compromise on safety? How do you rate Modi's ministers?